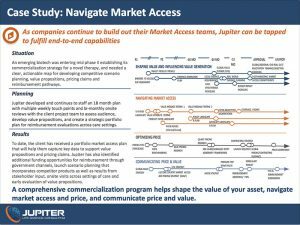 Market access and pricing potential is more than just a process of connecting a target product profile with a payer. It is understanding how payers value your product and how best to communicate this value on common ground. We help you influence the right evidence generation to support your desired market access and pricing strategy. 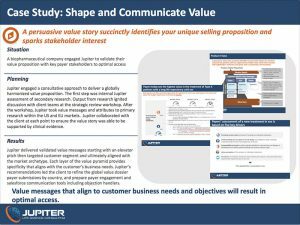 Tailoring and communicating your value proposition takes more than just knowledge. It takes experience. 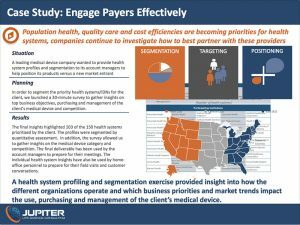 We place a market access lens on your target product profile development to help you understand evidentiary hurdles, conduct a gap analysis to compare your evidence generation strategies to your desired strategy, develop and validate a persuasive value story to ensure your product is there for appropriate patients in need. To be successful, value strategy needs to start early so you can define your value before it is defined for you. 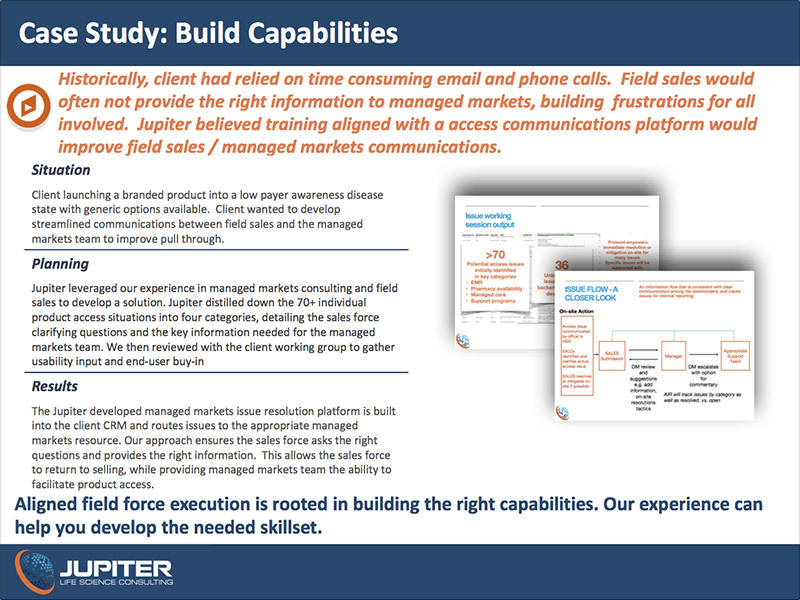 Click image to enlarge case study. 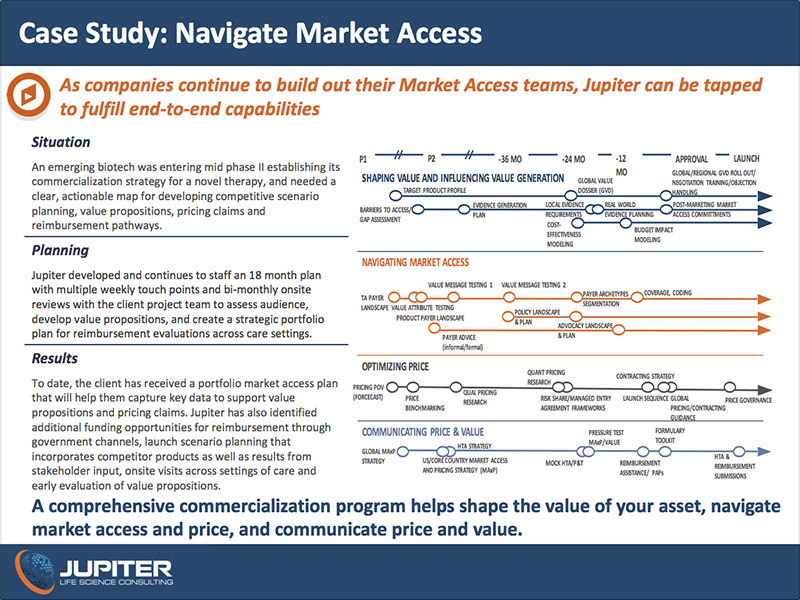 Who determines market access success? Payers. We think of payers broadly. A payer is any stakeholder who determines or influences the evaluation and purchase decision of your product. It includes payers in the traditional sense, but also physicians, patients and advocates who can influence the purchase decision. We help you identify who your “payers” are, the actions you want them to take, the value that resonates with them and the evidence required to get your product to appropriate patients. In our experience, payers say they want to provide access to those patients in need, but increasing healthcare costs and limited budgets are making this unsustainable. We engage payers to help you navigate their behaviors, attitudes and beliefs to shift purchase decision perspectives from “why” to “how”. We focus not only on current payer management behaviors, but we also assess future disruptive market access and pricing trends to ensure your organization is ready. What are payers most often concerned about? Price. ​The economics of pricing strategy in the global pharmaceutical industry is a constantly changing science. Whether you need a quick commercial assessment, qualitative and quantitative value-based pricing research, or launch price setting and sequencing, defining your optimal pricing strategy is central to your commercial success. This requires balancing price within the rules of different local payer systems, while also being able to manage price across markets and the product lifecycle to obtain market access for patients in need, and realizing your shareholder revenue and profitability responsibilities. We help you understand the pricing potential for your product, and the trade-off of price and access. Our goal is to find the price where you will gain access to the maximum number of target patients at the optimal level of reimbursement. 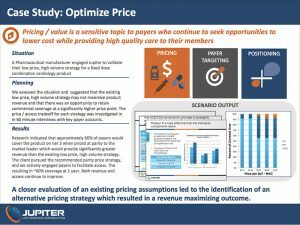 We know that price can engender strong reactions among payers. 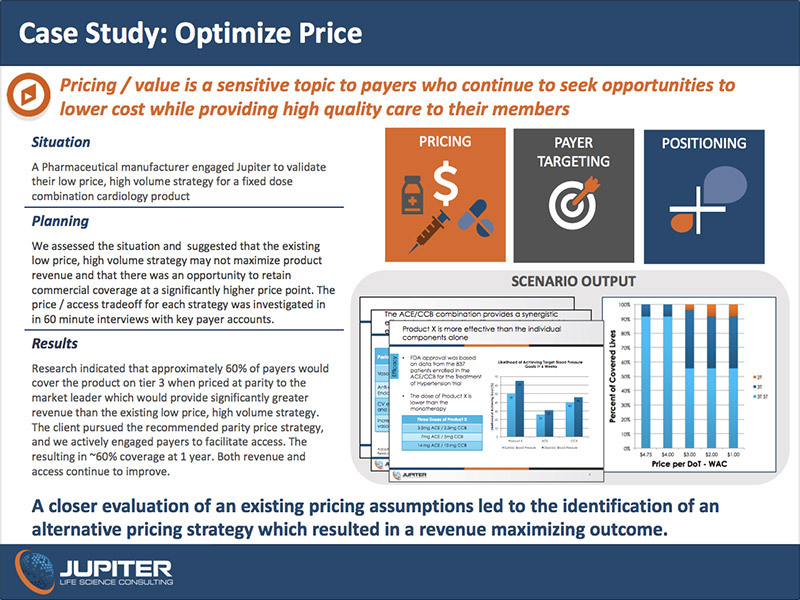 Because of this, our payer interviews are undertaken by senior Jupiterians who have depth, understanding and experience with these issues, not just as consultants, but also from their own experience in the industry as pricing experts and as payers. Our experience allows us to filter rational concerns from emotional perspectives, ultimately helping us provide you with meaningful and actionable pricing insights to inform your strategies and optimize the pricing potential of your product. 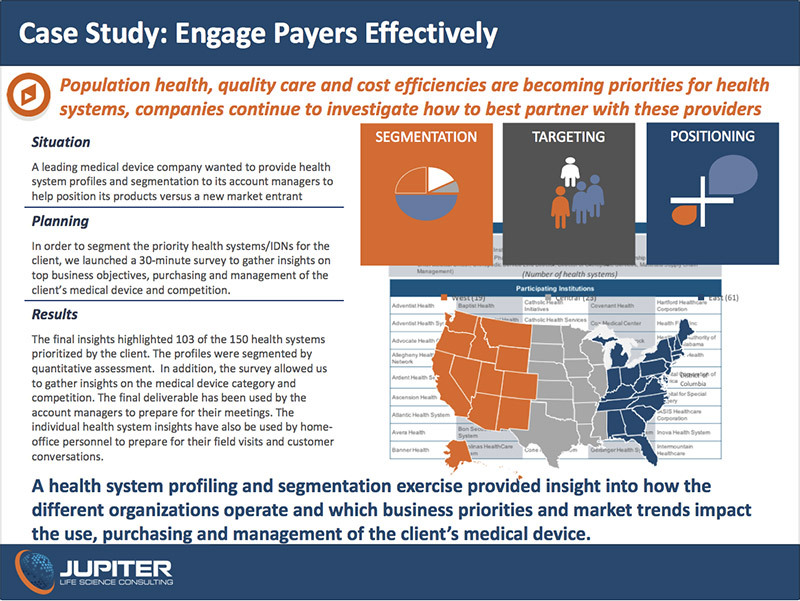 Effective payer engagement is about understanding decision-making behavior. Jupiter has a deep payer bench and a senior team that will help you navigate this influential audience’s attitudes and beliefs. Our goal is to help you reach the best mutually acceptable solution with payers, to help you achieve your desired market access and pricing goals. How can you influence those who make the decisions about the market access and price of your product? In our experience, effective payer engagement trumps didactic presentations. Whether you prefer one-to-one in-depth discussions, advisory board (IRL or virtual) or online survey, we’ve got you covered in a manner designed to minimize “group think” and to provide thoughtful and well-reasoned responses to inform your business needs – not the typical payer research verbatims that lack true insight. We identify the right payer advisors and engage them across market archetypes at the national, regional and local levels. 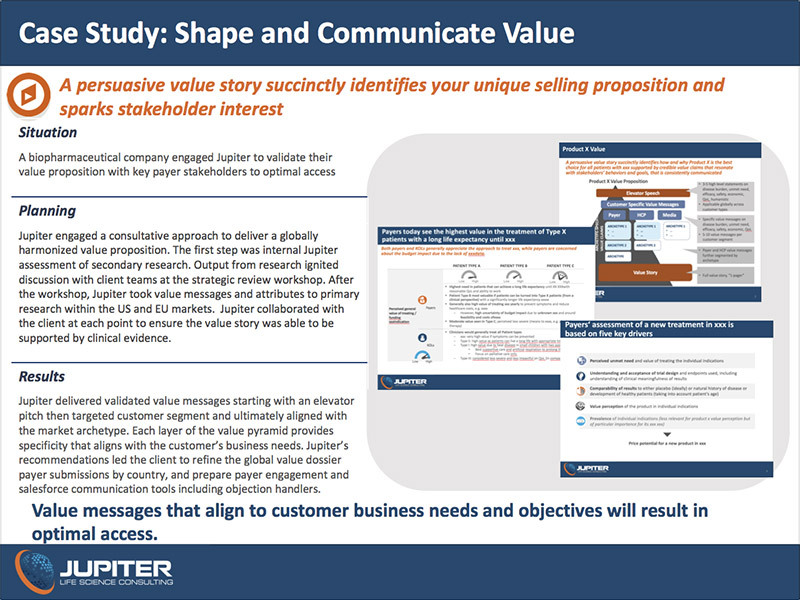 Our senior approach to payer engagement will help you define a compelling proposition that communicates value and supports market access at your desired price. Through a unique partnership with the University of Wisconsin School of Pharmacy, we have the resources to ensure your market access strategy is translated to execution, both for your internal teams and field forces. 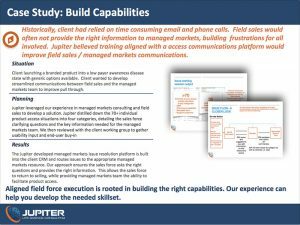 Leveraging our combined experiences in academia and industry, we develop and ensure your training/education is customized for your market access strategy. The University of Wisconsin School of Pharmacy is well-known for its best-in-class training programs, incorporating adult learning principles to the development of both online and in-person education programs. 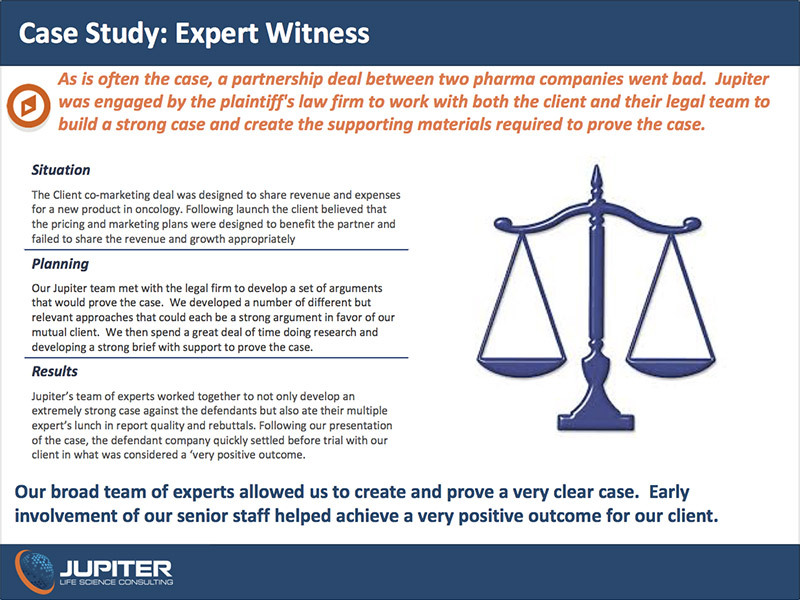 Jupiter Life Science Consulting leadership has successfully been engaged to act as an expert witness on pricing and market access issues. 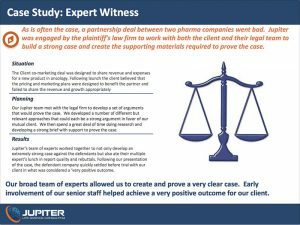 We produce the supporting evidence to communicate your position and will stand strong against any competing expert witnesses. We talk to your payer customers on a daily basis. We know their challenges and the viewpoints they will bring to your technology. We act as your internal expert witness to assess pricing and market access strategies to both validate your approach and identify gaps. Click to enlarge case study.